Pet Shop in St. Ives and Onlineshop | Rocky's Pet Care - We love pets! In our present online shop and soon in St. Ives (Tregenna Hill), you will find high quality selected goods at fair prices. 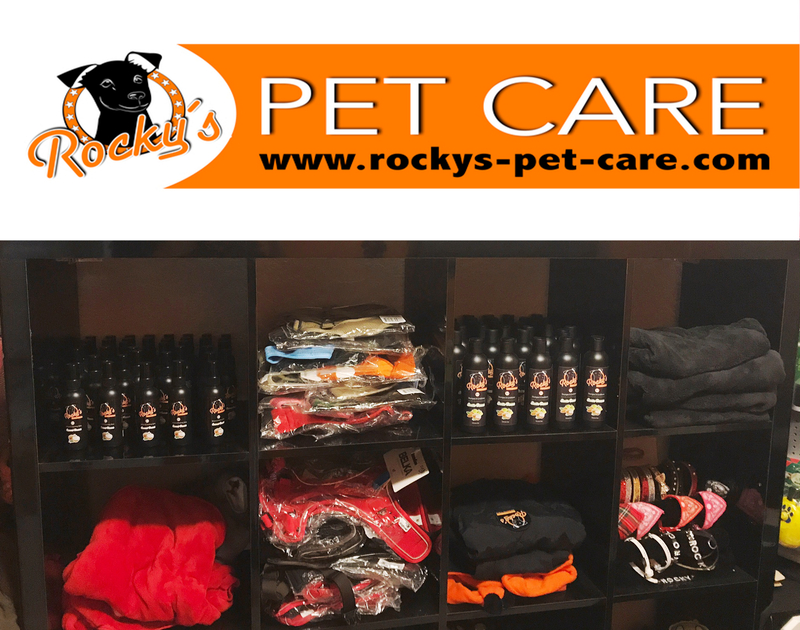 We offer our own products from the “Rocky’s Pet Care Collection”. These include: Shampoo & Conditioner, Care Spray, Paw Care Cream, First Aid Spray, Detangling spray, UV Protection Spray, Eye Care, Ear Care – all without silicones and from natural ingredients, produced in Germany. In addition, you will find our handmade dressing gowns, winter jackets, sweaters and our specially designed “Doggy Mac Pack” rain coats – made in England. Other practical items are: Life vests, harnesses, leashes, collars, drinking bottles and folding bowls for on the go, poo bags and water toys. Our selected foods include our own brand “Charly’s delicious” – high quality dry food without grain in 5 different varieties, made in England, real meat snacks, chewing snacks and tooth care snacks. As we received so many mails form locals already, we decided to go a bit “bigger”. We will also include items for cats, birds and fishes in our assortment. All items can also be purchased at our online shop.